Caring for mature trees can seem like a full time job, but it is necessary to maintain current property values. ISA Arborists have made tree services their full time jobs. Hiring a trained and experienced professional can be expensive. Making the decision can be especially difficult if you aren’t convinced that you need one. Many homeowners only hire the cheapest professional they can find to save money. However, learn more how trying to save a few bucks by Doing It Yourself (DIY) or working with an inexperienced professional could cost a lot more in the long run. There are a lot of things that can go wrong when working on a tree. Even ordinary pruning tasks can threaten the life of the tree or permanently damage your home. Many homeowners assume that they can cut limbs or even fell trees on their own because they have a chainsaw. In Dallas-Fort Worth, a young man was killed when he felled a tree and it came crashing down on top of him. CBS News of Dallas-Fort Worth reports that the man was one of the friends of the homeowner, who had decided to take down the tree without professional assistance. (http://dfw.cbslocal.com/2012/05/30/medstar-fort-worth-man-cutting-down-tree-dies-in-accident/) Calling a tree service would have left everyone alive and healthy with the tree safely on the ground. Falls account for more than 1/3 of all injury deaths, and they are the leading cause of home injuries. Here’s how you can stay safer: According to Courtney Kreuzwiesner in an article posted on www.livingwithmyhome.com. Trees do not always fall the way one might expect. Even attaching a chain and attempting to pull one down can go wrong quickly. 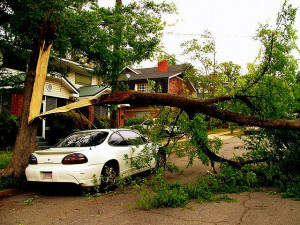 It is crucial to hire a professional to remove trees near power lines or next to a home. Failing to remove a dangerous tree can also cause injury or damage when the tree makes contact with the power lines, warns the Great Falls Tribune. 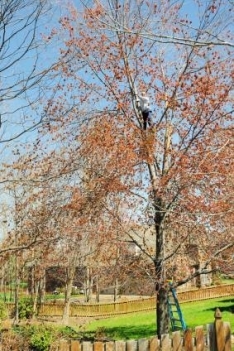 (http://www.greatfallstribune.com/article/20130329/LIFESTYLE/303290049/Proactive-pruning) Saplings may be cut by a homeowner when they are still small, but should be felled by a professional when taller than the individual cutting the tree. Fences may make good neighbors, but watch out if your limbs are growing near or over that fence. A large limb that falls on your neighbor’s property may be your responsibility if the trunk is in your yard. The experts at Penn Live warn that judges may find one negligent, and responsible, if they knew a tree on their property border needed care but failed to handle it. (http://blog.pennlive.com/life/2013/04/when_trees_go_delinquent.html) Your neighbor may be willing to split the costs if approached in a cooperative fashion before any incurred damages. Other mistakes made by homeowners trying some DIY arbor care are less serious but still troublesome. 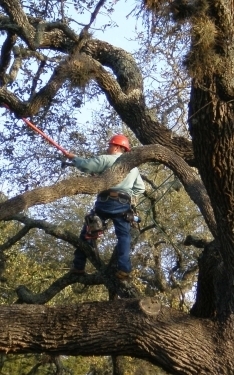 Making incorrect pruning cuts can stunt the growth of a majestic live oak or allow rot to penetrate the heartwood. Many owners have killed beautiful mature oak or elm with mismanagement. Invest in the health of your home landscape by entrusting your tree care chores to a professional. Handling your own arbor care or skimping on professional maintenance, could cause expensive repairs at best and take a life at worst. This is especially true when working with large and established growth shadetrees. 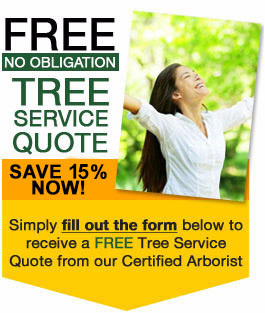 Hire a professional service to evaluate and take care of your trees to keep them healthy and strong.